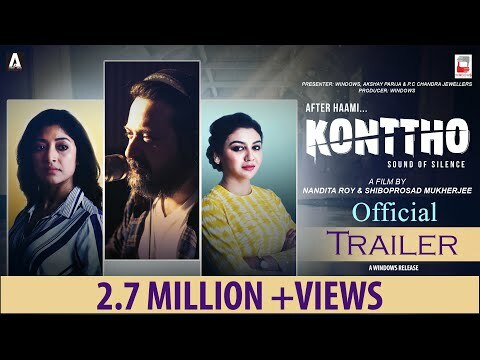 Konttho is a movie directed by Shiboprosad Mukherjee, Nandita Roy featuring Jaya Ahsan, Paoli Dam. The ending of the trailer also provides an explanation for the film's poster featuring Arjun as the iconic Bhooter Raja from Satyajit Ray’s Goopy Gyne Bagha Byne (1969). Composed by Prasen, the soft number has been rendered by Sahana Bajpaie in her signature style. Filmmaker and actor Shiboprosad Mukherjee is featured as an avatar of Bhooter Raja from the 1969 Satyajit Ray classic.